Drawing on her forty years' study of the Chinese classic, the author of The Left Hand of Darkness presents a fresh, modern version that captures the poetry of the Taoist text, accompanied by her commentary. Reprint. 30,000 first printing. Amazon.com description: Product Description: No other English translation of this greatest of the Chinese classics can match Ursula Le Guin's striking new version. Le Guin, best known for thought-provoking science fiction novels that have helped to transform the genre, has studied the Tao Te Ching for more than forty years. She has consulted the literal translations and worked with Chinese scholars to develop a version that lets the ancient text speak in a fresh way to modern people, while remaining faithful to the poetic beauty of the work. 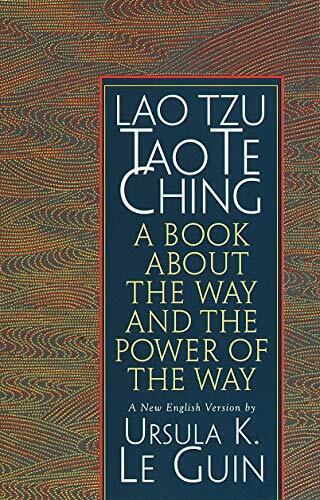 Avoiding scholarly interpretations and esoteric Taoist insights, she has revealed the Tao Te Ching 's immediate relevance and power, its depth and refreshing humor, in a way that shows better than ever before why it has been so much loved for more than 2,500 years. Included are Le Guin's own personal commentary and notes on the text. This new version is sure to be welcomed by the many readers of the Tao Te Ching as well as those coming to the text for the first time. With Ursula K. Le Guin, J. P. Seaton (other contributor) | Har/com edition from Shambhala Pubns (October 13, 2009); titled "Lao Tzu: Tao Te Ching: A Book About the Way and the Power of the Way"